This one-year devotional gives you a year’s worth of activities, questions and ideas that will keep young readers engaged with the Bible. 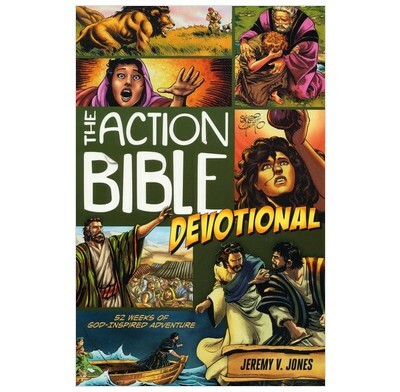 The Action Bible Devotional pairs selected stories from the bestselling Action Bible with spiritual lessons and action-adventure missions that launch kids’ faith into everyday life. Covering themes such as friendship, temptation, sibling rivalry, self-esteem, and materialism, The Action Bible Devotional offers a year’s worth of activities, questions, and ideas that will keep young readers engaged with the Bible every day. Disappointed that this is not an accompaniment to the excellent Action Bible, which we have already been using with our children. Just 52 devotionals - one per week. More than 50% of it is just the Action Bible pages repeated. The devotional material is not bad in terms of the notes, activities and questions asked, but there is loads of blank space intended for writing or drawing in so overall expensive for not much new material. I wish this had been brought out as a thin supplement to be used alongside the Action Bible.